Have I ever mentioned, dear reader, that I have the best husband in the world? Well, I do, and I can prove it. Yesterday was our 36th wedding anniversary and look what my DH got for me. Yep, that’s right. 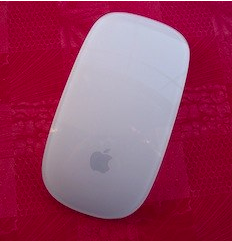 That’s Apple’s new wireless mouse, the Magic Mouse. 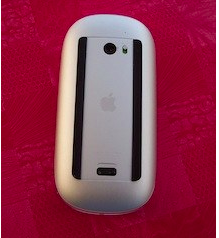 Here’s what the bottom looks like. All right, it’s time for some knitting content, boys and girls. Today’s featured photo is of the center of The Cat’s Day Shetland Shawl, which is the first Shetland-type shawl I ever made. 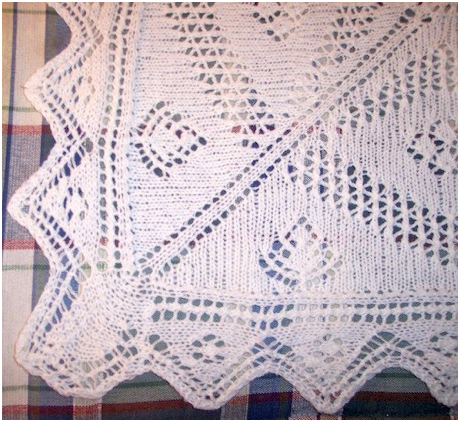 I completed this shawl quite a few years ago, from a kit I bought from Blackberry Ridge, probably around 2003. But that was before I started to sort of keep a knitting journal, so I don’t remember exactly when I made it or how long it took. I do remember that the pattern had several errors in it and I did have sense enough to write corrections on the pattern itself. Anyway, I got this shawl out the other evening because I was freezing cold, and since it was out, I decided I should take pictures of it. Here’s a shot of the corner of the edging. 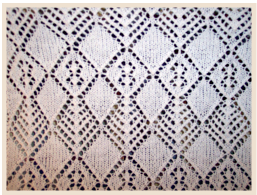 One of the best aspects of Hazel Carter’s designs is that each shawl has a story that goes with it. 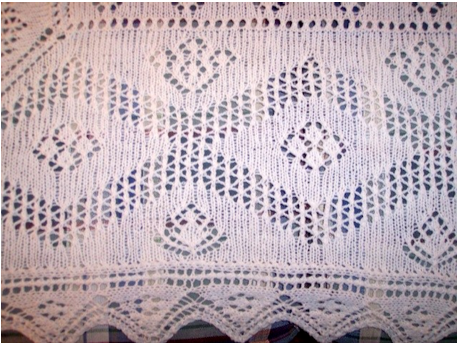 All the patterns in this shawl tell the story of a typical Shetland Island cat’s day. Here’s a picture of the border where the kitties get caught in the fishing nets that are spread on the beach to dry. The project that is getting most of my attention right now is the scarf I am making based upon Hello Yarn’s “We Call Them Pirates” design. If you recall, I knitted a cap for a podcaster named Joe Prova, who is one of the hosts of the Chariots of Iron Podcast, of which I am a fan. Joe loves his “We Call Them Pirates” beanie and subtly hinted that he would love a matching scarf. By subtly hinted I mean that on the podcast he said that he loved his hat and thinks it would be effing cool if Pinko Knitter made him a scarf to match. You can see a picture of Joe wearing his beanie 3. Page down to the entry for September 28, 2009, “I’m goin’ to California!” Isn’t his little boy adorable? Of course, I can’t just leave you hanging. 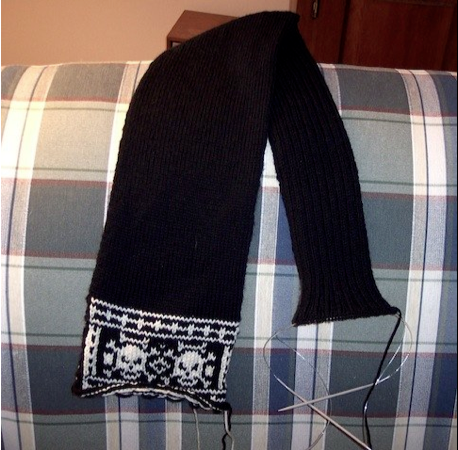 Here’s a picture of the scarf in progress; it’s a little over half-way done. Whaddya’ think?